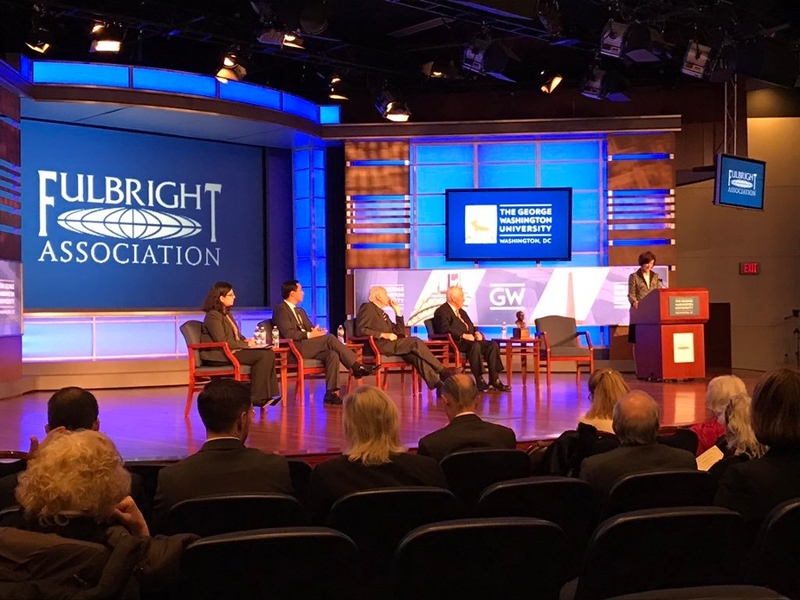 Former U.S. Sen. Richard Lugar, a Distinguished Scholar and professor of practice in the Indiana University School of Global and International Studies, has received the J. William Fulbright Prize for International Understanding. The honor recognizes those who have brought about significant lifetime achievements in international understanding, peace and security. Previous recipients have included Bill and Melinda Gates, Doctors Without Borders, former Secretary of State Colin Powell, former Philippines President Corazon Aquino, Nobel laureates Desmond Tutu and Nelson Mandela, former Czech President Vaclav Havel and International Atomic Energy Agency head Hans Blix. The 18th recipient of the award, Lugar was honored Thursday at the Fulbright Association’s annual conference in Washington, D.C.
“As a Rhodes Scholar at Pembroke College, University of Oxford, I first corresponded with Sen. J. William Fulbright and was impressed with his encouragement of young Americans to prepare for leadership in the world," said Lugar, who also directs the Washington-based Lugar Center, which advocates for evidence-based approaches and policy options to build a more stable and prosperous world. IU President Michael A. McRobbie said Lugar is most deserving of the Fulbright Prize, noting his contributions toward international understanding and his support for academic interchange of ideas. “As a U.S. senator, one of our nation’s finest and most respected statesmen, and a champion of bipartisanship, Richard Lugar served Hoosiers with great distinction, and we are extremely grateful that he has chosen to continue his service as a distinguished member of the faculty of Indiana University’s School of Global and International Studies,” McRobbie said. “In this role, he has provided our students and faculty with opportunities to learn from one of our country’s foremost authorities on international politics and diplomacy and a leader with expertise in confronting the critical political and global issues of our times. A longtime advocate of global engagement, he has also inspired IU students to seek overseas study and other educational opportunities to deepen their understanding of and engage with the world around them. Lee A. Feinstein, dean of the School of Global and International Studies, said the award properly recognizes the unique accomplishments of a respected statesman and global leader.